Time keeps getting away from me. Bob and I have finally gotten over being sick and the made midterm rush at work is over, so things are slowing down a bit. I’m still not sure where the days go sometimes. Our favorite cheese shop has a resident chef interning there this winter. He is learning all about craft and artisanal cheeses and Louise made the smart decision to have him also so what he he does best – cook. They started a monthly pop up dinner at the shop. 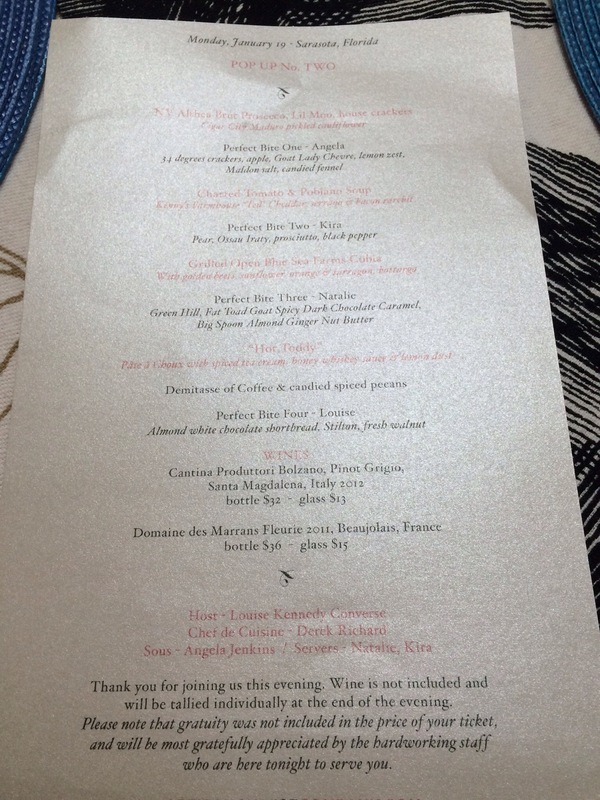 What is a pop up dinner? 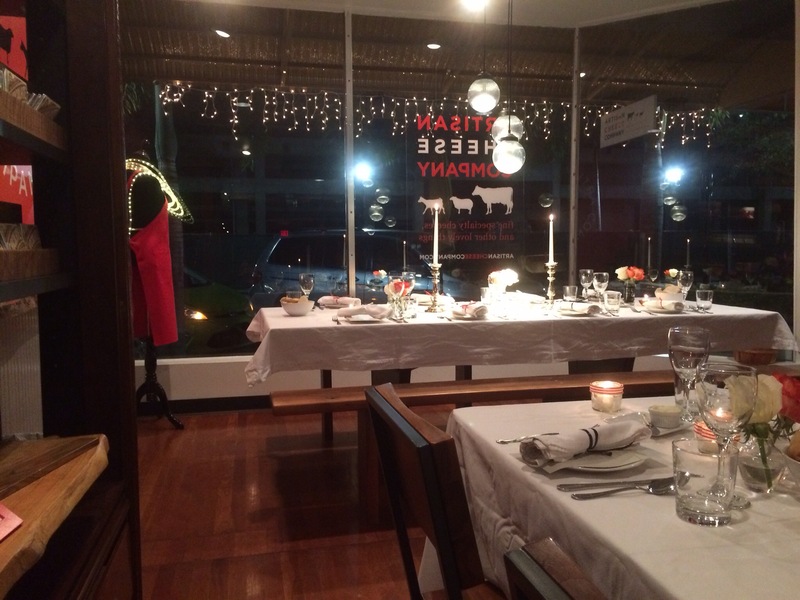 We’ll … It’s a restaurant dinner that happens for a very short period of time. In this case the dinner is one night only. We were not sure exactly what to expect, but whatever it was exceeded our expectations. The dinners are limited to 20 people so you can actually talk to people around you and Louise does a great job of seating you next to people you want to have a conversation with. Bob and I got to talk with a local chef and his wife (who happens to work at one of our favorite restaurants in the area). It was great and since the chef if opening a limited run dinner service at a local restaurant soon, we have a new place to explore. This is a cheese shop, but this wasn’t just a cheese dinner. This was regular, but extremely well done, food. We had a perfect cheese bite in between each course and they really were perfect bites. The goat cheese with lemon dust and candied fennel was probably my favorite, but I also loved the Louise gave me cheddar instead of blue in the last cheese bite. It worked perfectly, but I didn’t feel like I was missing anything. 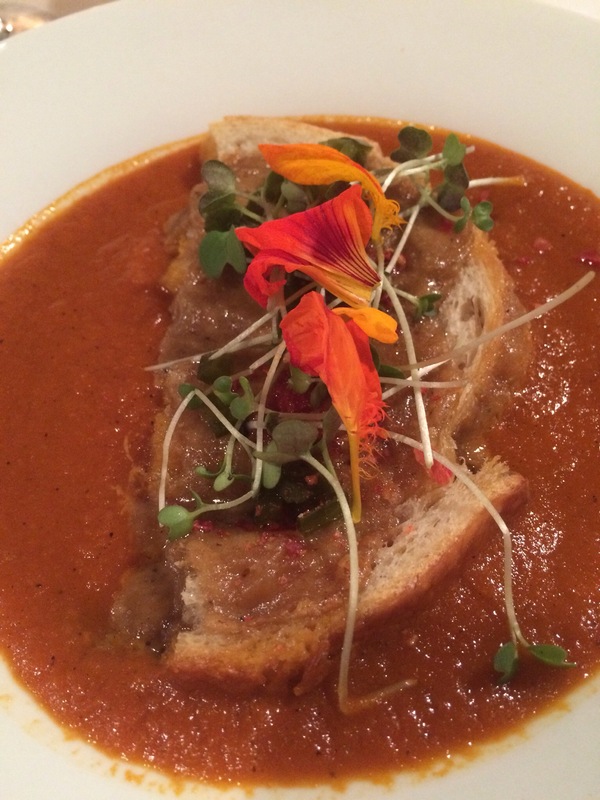 To tell you how good everything was let me sum it up this way – I was so enamored by the food and the company and the experience I only remembered to take a picture of one dish. One. The roasted tomato and poblano soup was amazing – as was the gnocchi I had for the main course (Bob has fish) and the play on a hot toddy for dessert. It was a great experience, and something that you don’t get to do very often. I also think I need to keep an eye out for what Derek does next – he really is a very, very good chef. Given that Bob and I have no problem making travel plans around food and eating, we might just end up with an unexpected location in a year or two. Hopefully I will have more frequent posts as we settle into the year and the semester. How much is a ‘clove,’ exactly? I browse recipes. I get bored and I search for interesting recipes or something different that I might actually be able to make. While doing this I’ve come across the instruction for “a clove of garlic” or “two cloves of garlic, crushed,” etc. 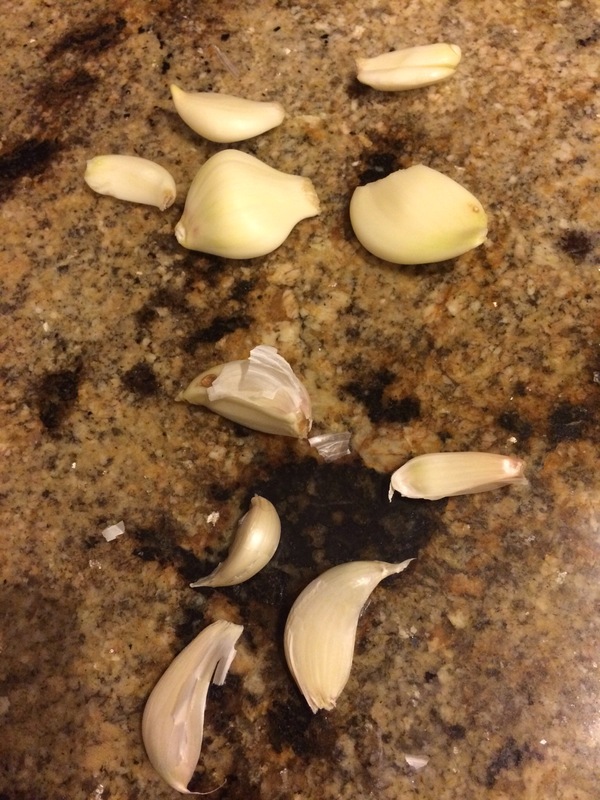 What I’ve also noticed from using a lot of garlic in my cooking is that the size of a clove of garlic varies greatly. A head of garlic is fairly straight forward. 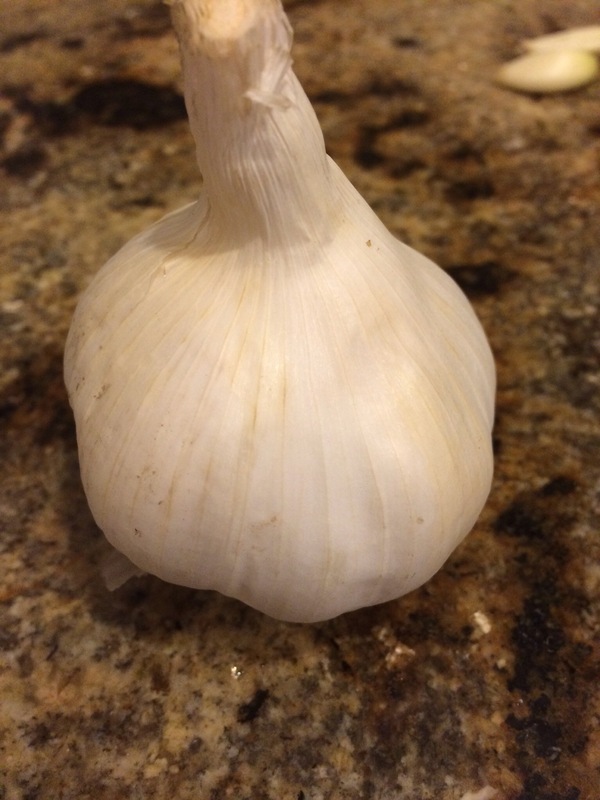 A clove of garlic, however, is not so uniform. 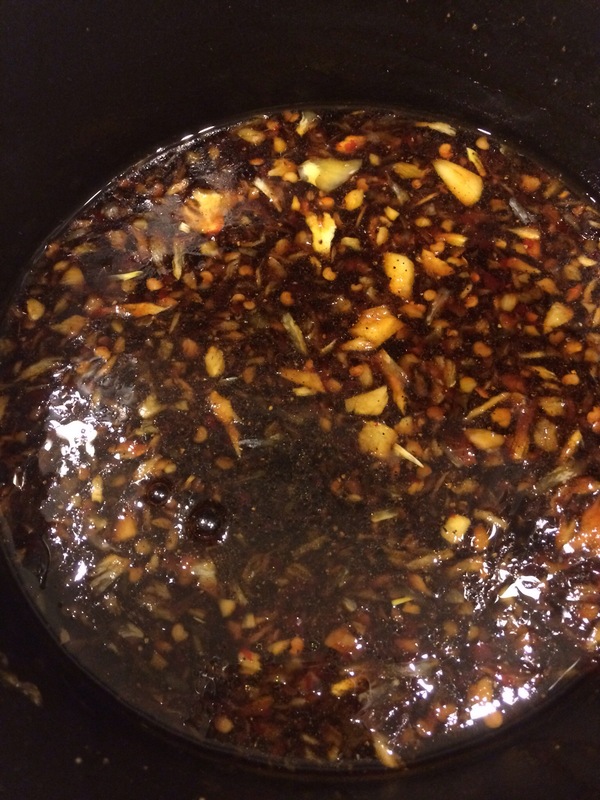 Generally I try to go with the medium size clove and adjust from there. But is that right? Is my guess at the size of a clove correct? Does it really matter? Probably not, but for some reason it bugged me today. That said, I did make a rather odd experiment today. I have been craving pulled pork for about a week now. I haven’t cooked much meat in recent months, but I think the cold front (and yes, it did get cold here, just not freezing) put me in the mood for comfort food, and pulled pork is one of my all time favorites. Usually I make this with my version of Grandmom’s BBQ sauce, but today I wanted something a little different. My sauce cookbook had a recipe for Korean BBQ sauce in it, but I was missing sesame seeds, so I scoured the Internet for another version. 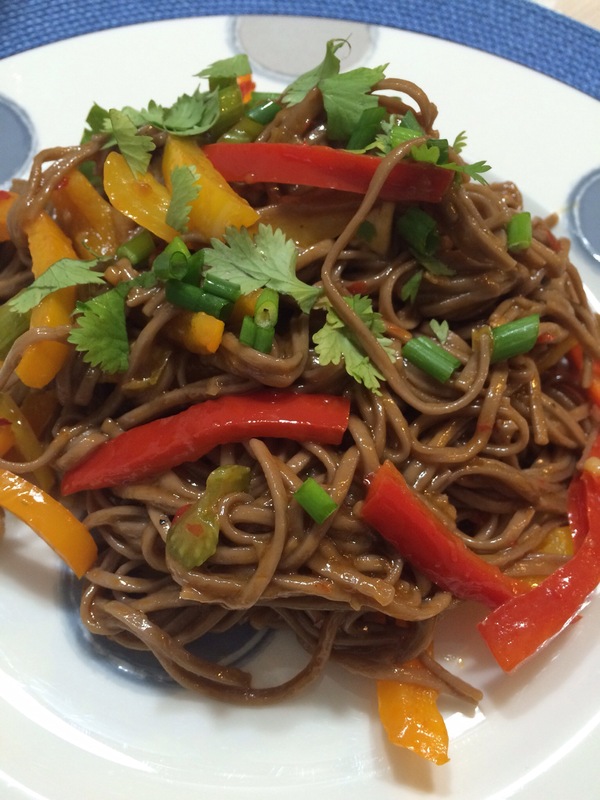 I found one recipe that used ingredients I had on hand. This recipe, calling for five cloves of garlic, combined with my wildly varying sizes of cloves today, prompted the above question. No satisfactory answer has been found. But, I digress. I skipped the thickening part of this recipe and left out the cornstarch. 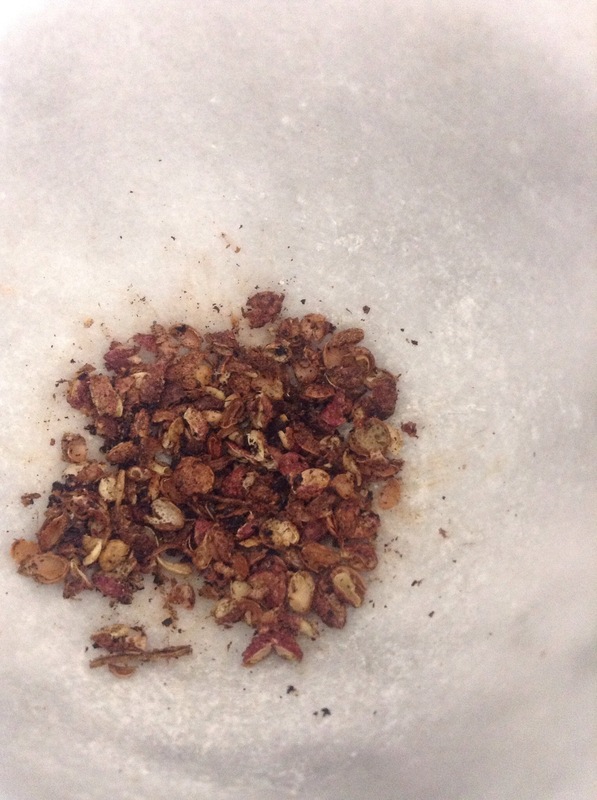 I also blended it in a blender just a bit to get everything smooth since I don’t have a garlic press and the mortar and pestle didn’t exactly get everything to a paste. Anyway, I made up the sauce as the pork was cooking. 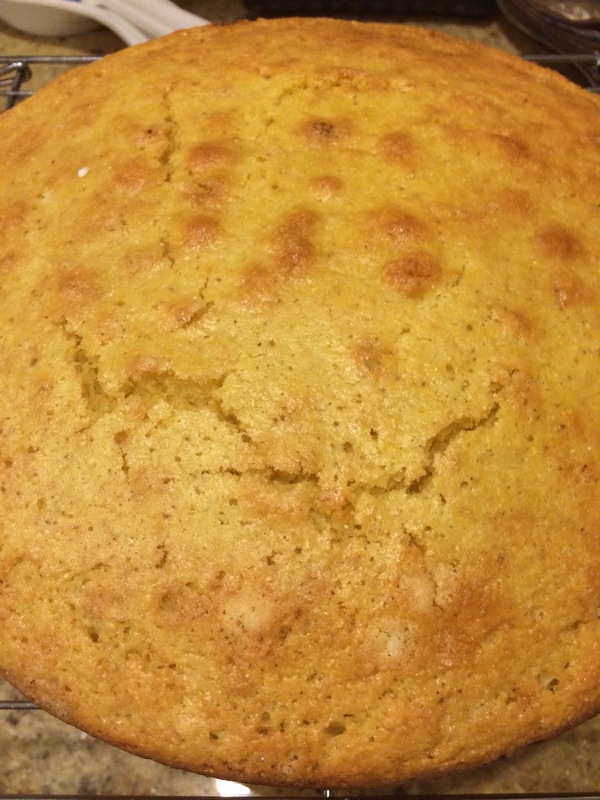 I also made corn bread. This probably counts as Northern Cornbread or Yankee Cornbread since it has sugar in it, but I happen to like that version of cornbread, so I’m going with it. 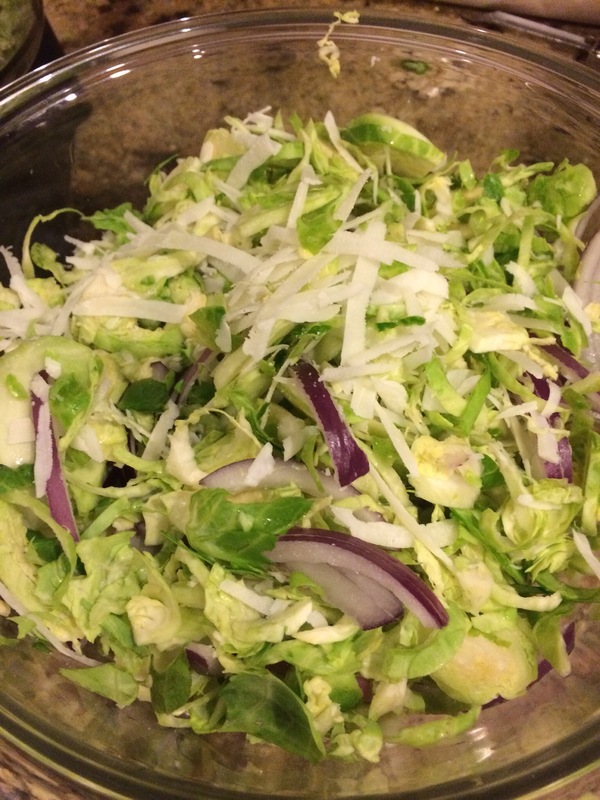 I also found this incredible Brussels Sprout Salad that I just had to try. It looked so fresh, so bright and just so good that I wanted this for the crunch with my pulled pork. I actually used my Ninja with the disk to shave the Brussels sprouts. Way easier than hand chopping. So for dinner tonight we had a pulled pork with a Korean BBQ sauce, Yankee Cornbread and a Brussels Sprout Salad with an Italian cheese. This should not have worked. The flavors should have clashed. 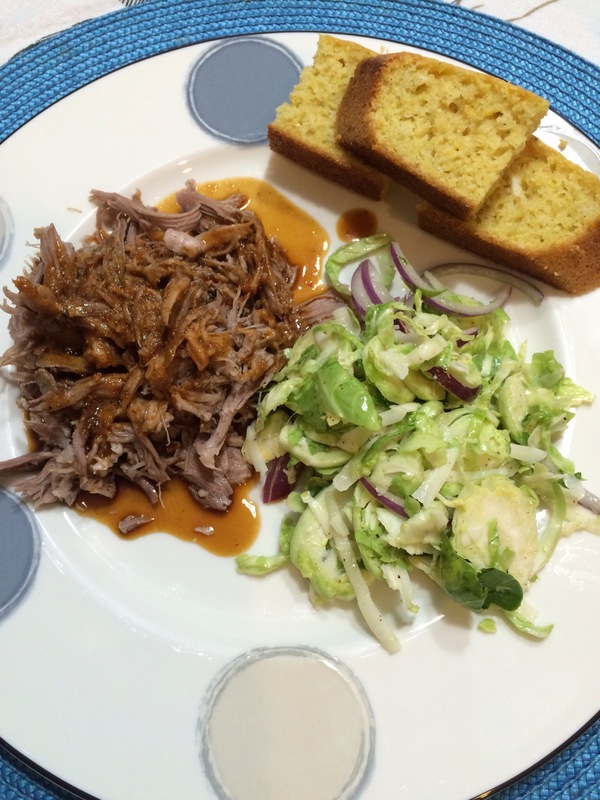 Instead, the savory pork went exceedingly well with the salty sauce, which was cut by the brightness of the salad and tamed by the semi-sweetness of the cornbread. The South American wine I had with it was ok. Well, the wine was very good, but it only paired ok with the meal. 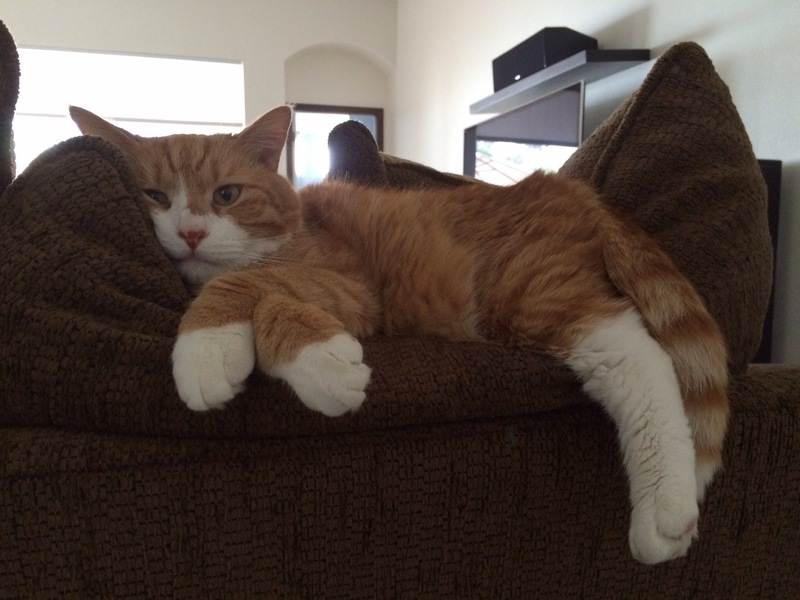 As a bonus, Bob loved all of it and we have leftovers for a few days. Gracie tried to help. 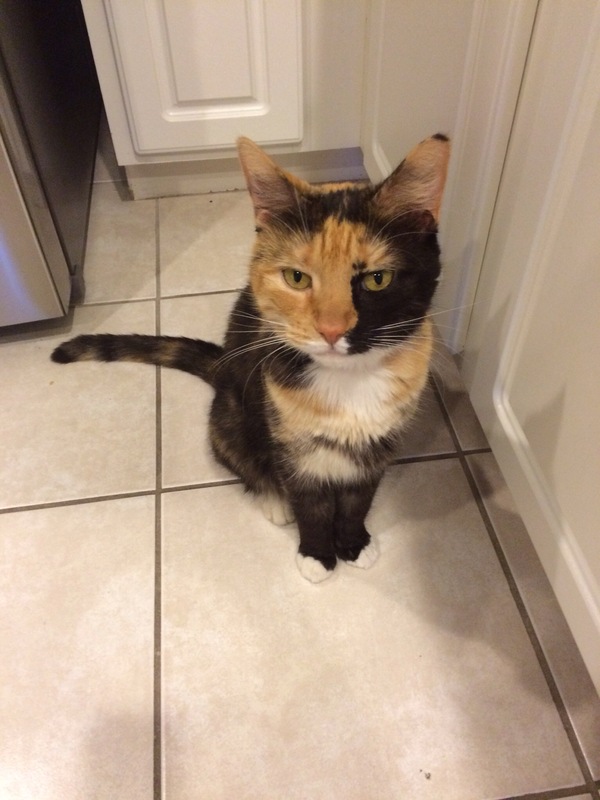 She likes helping, but really, I think she just wanted the cheese. This does not include the actual food experiments. Sobs noodles with a Kung Pow sauce. I also managed the butternut squash and noodles in the Buerre Blanc sauce and an Asian tofu dish I was desperate to try. My cookbook calls it Mapo Doufu. I call it tasty looking so I had to try it. 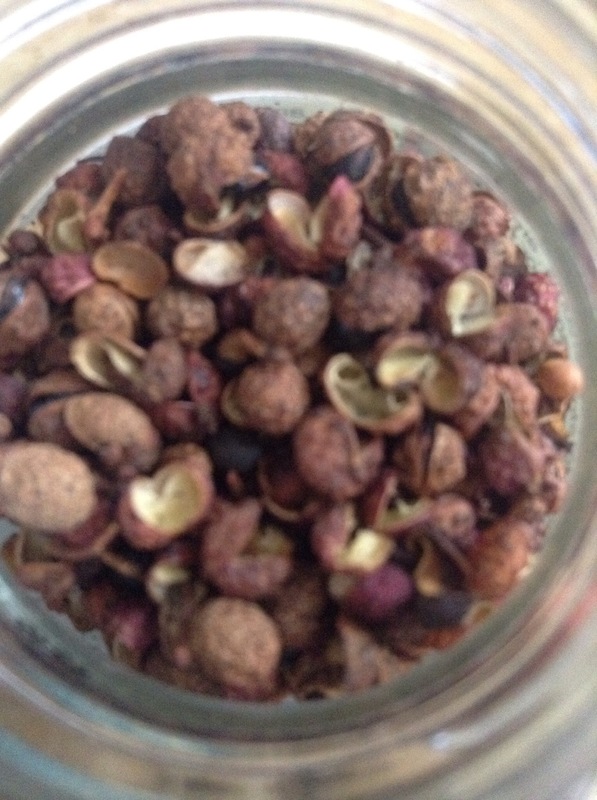 This did require acquiring Szechuan Peppercorns which look a lot like regular pepper, but taste nothing like pepper. Apparently they are a staple in Chinese cooking and related to citrus. Or so says my cookbook. After picking up a jar at the local spice store on the one day that I didn’t feel sick, I started the dish. 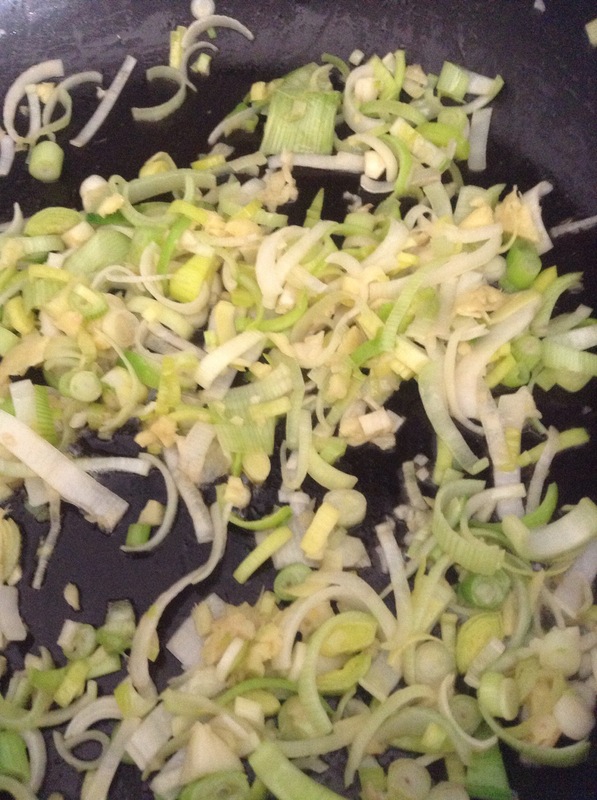 Into a hot pan (with sesame oil) went leek and scallion – the white parts of each – with garlic and ginger. 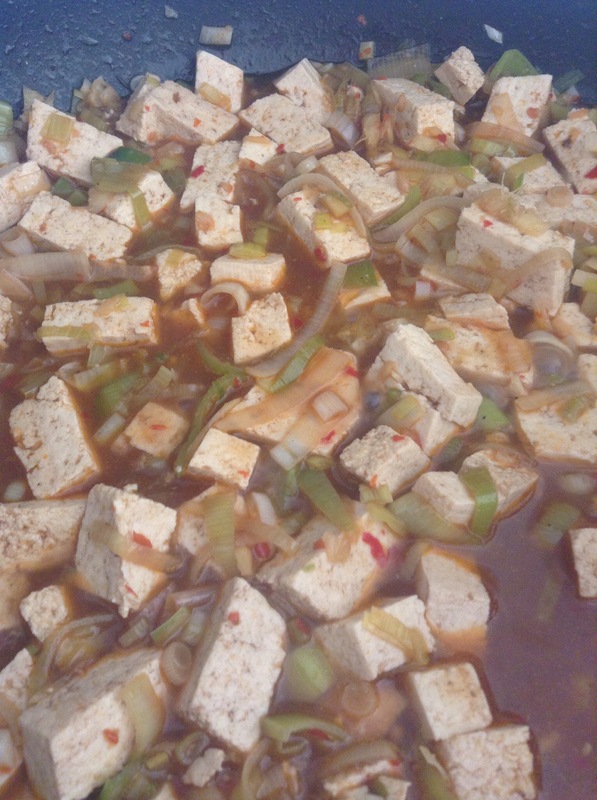 Cook until soft then add tofu cut into chunks that has been marinating in soy sauce, garlic and ginger. I cheated here and bought the diced tofu instead of the regular block. Same amount, same cost, less work for me. To this I added a teaspoon of the peppercorns, ground with a mortar and pestle and strained so as not to get the hard casing. Stiff and let cook a few seconds then add one cup vegetable broth, one teaspoon chili garlic sauce and two teaspoons of black bean sauce. (The last two ingredients are in the Ethnic aisle of most grocery stores.) I let that cook for about ten minutes, letting the sauce reduce and thicken just a little. 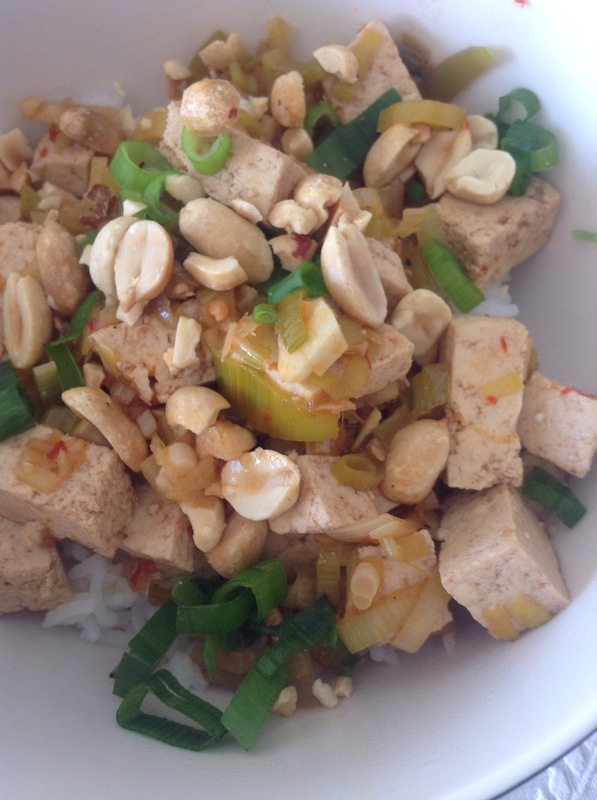 I played that over rice and topped it with some peanut and the green parts of the scallions. It was a pretty dish, a tad spicy and really good. 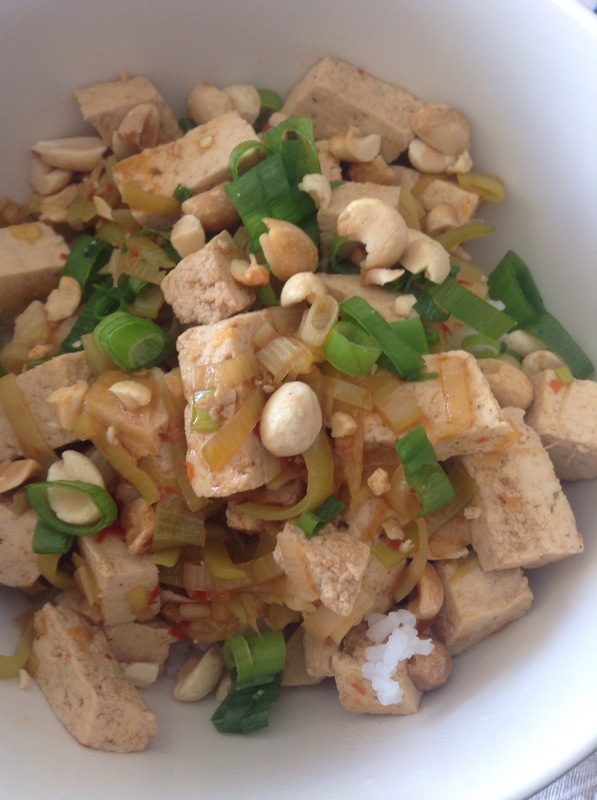 Bob liked it – didn’t mind it was tofu – and we put it on the make again list since it was fairly quick and easy.